The Winter Pool Cover – 5 Tips to Keep in Mind! As we move through one season to the next we know that pools are being closed for the winter. With this we know that you are looking at and thinking about your winter pool cover and it’s many pros and cons. We know that there are many things to think about when getting your pool ready for the winter. Your winter pool cover and it’s proper use should be at the very top of those things on your mind. We know that there are many tips and tricks for your winter pool cover to work it’s very best and this article that we found will highlight the top 5 tips! Winter Pool Covers take a beating every winter as they protect above ground pools from the nastiest of elements: rain, ice, snow and especially wind can take a toll on your pool if not winterized and covered correctly. Aboveground winter covers in particular can cause lots of problems if not properly installed. Haphazardly placed covers are a sure-fire way to shorten the lifespan of the cover and possibly your pool. To protect your cover and your pool… 5 aboveground pool winter cover tips. Above ground pool owners will be relieved to know that most of these tips involve very simple and affordable solutions, perfectly exemplified by Air Pillows. Winter cover air pillows are used to keep a solid ice sheet from forming on the surface of your pool water. Air Pillows are placed in the center of the pool, with the pool cover pulled tight over the pillow to press it into the water. Pool Pillow Pal is a $10 accessory to hold the air pillow in the center of the pool. Tip: Inflate your air pillows in seconds with a Shop Vac. Wind is possibly an above ground pool cover’s worst enemy. Above ground covers can be trashed if winds gets under the edges and begins to whip and flap the cover. Secure the winter cover cable tightly with the wench (included with all above ground winter pool covers). However, that’s not enough to stop strong wind. Some folks weigh down the cable, with milk jugs or use our Wall Bags, which is fine for moderate winds. The best options to keep out heavy winds are either Cover Seal (shown) or Cover Clips, both made for this purpose, with the added benefit of keeping your cover taut and smooth all winter. 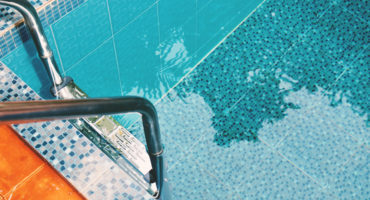 It’s important to keep an eye on your pool’s water level. If it drops more than an inch, it can stress the cover and the pool. 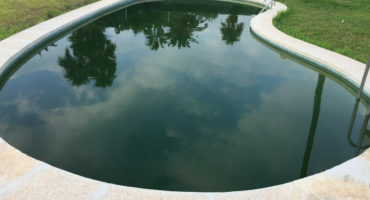 If the pool loses 6-12″ of water, with rain water pooling on top of the cover, it will damage the cover and possibly the pool. Fix leaks before closing, or add water under the cover if needed. Also important to mind the water level on-top of of your winter cover. A small bit (1/4″-1/2″) of rain water is OK, but more than that could stress the cover, and 6-12″ of water will push pool water over the edges, lowering pool water (see above). Pump regularly with a pool cover pump like our manual or automatic 350 GPH pump or the non-electric Cover Saver siphon pump (shown). Pump the water a good distance, to avoid over-saturating ground near the pool,and be careful not to pump out pool water through holes in your winter cover! If the cover has small holes, place the pump far from holes, or use upside-down Frisbee as a pump base. Leaves on the pool cover can get real messy, real fast. Trying to remove leaves and sticks with a skimmer net or pool brush is not very effective. Instead use a Pool Leaf Rake to scoop it off – much more effective, but not easy, definitely not fun, and sharp sticks could damage a pool cover. If your pool has large trees within 50 ft. – take a look at our Leaf Nets for above ground pools. Place this over your pool cover when closing, and remove after all leaves have fallen. Two people can remove every leaf in seconds, and easily carry it away. That’s Fun! Super durable carbonized mesh can also be used spring and fall, to keep an open pool clean. If you are like me, once you winterize, and you know you’ve done it right, you probably try not to think about your pool until the spring. I’ve learned that this is a huge mistake. Tending to your above ground pool is essentially a year round responsibility. Final Tip: you can’t just set it and forget it. You will need to visit your pool cover regularly, not just for dewatering and dredging activities, but to tighten-up the cover to pull out slack, correct wind gaps, readjust the air pillow(s). It only take a few moments a couple of times a month to run a quick check. The money you save via damage control is worth the effort. Of course, using those aforementioned products – Leaf Catcher, Pillow Pal, automatic cover pump and Cover Clips or Cover Seal, goes a long way towards an (almost) maintenance-free aboveground pool cover. Now You’re Ready to Close the Pool! These above ground pool covering tips are affordable, simple, and do not require a whole lot of your time – which makes them easy to neglect. As a pool owner, the cheapest, quickest path isn’t always (almost never) the best path. An above ground pool winter cover is an investment that protects a much larger investment: your pool! Spend a few extra bucks for a good cover, and spend time to do things right, along with the right winter cover accessories, and you can avoid mid-winter cover disasters! This article was originally published at blog.intheswim.com. If you are looking for a winter pool cover, don’t forget to check our selection of pool products! We look forward to hearing from you and helping you with all of your swimming pool needs!